Improvements suggested to the shuttle derived from the design as flown. American heavy-lift orbital launch vehicle. The design selected to boost America's Orion manned spacecraft into space in the 21st Century was a family of launch vehicles dubbed Ares. Originally sold as being derivatives of space shuttle technology, tinkering by NASA engineers and necessary changes during development quickly resulted in the designs being essentially all-new. Following inevitable cost growth and schedule slippage, it was cancelled in 2010. However continued development and eventual production of one derivative or another continued to be funded by Congress for many years afterwards. Status: Development. Payload: 6,000 kg (13,200 lb). Gross mass: 300,000 kg (660,000 lb). The Ares I would boost Orion to earth-orbit missions with the International Space Station beginning in 2012 (as of 2006 - this had slipped to 2016 by 2008). For lunar missions the Ares V super-booster would place a trans-lunar injection stage and Altair lunar lander into low earth orbit. An Orion orbited by a separate Ares I launch would dock with the stack, which would then be boosted by the TLI stage on a lunar-landing mission. As of 2008 the Ares V had grown in size to the maximum allowed by existing Saturn V facilities at the Kennedy Space Center. It was to fly by 2020, but with the Presidential election and an economic downturn looming, it looked increasingly unlikely that it would ever be developed at all. The Space Shuttle was sold by NASA to America in the early 1970's as a low-cost, reusable spaceship that would replace all existing boosters and manned spacecraft. The Apollo capsule and Saturn launch vehicles were scrapped. Production of all other expendable boosters would be discontinued once the Shuttle was 'fully operational'. The myth of its lower cost was maintained until the shuttle Challenger exploded on the way to orbit in 1985. In the post-mortem that followed, it was 'discovered' that the shuttle was actually more expensive and very much more operationally constrained than the expendable boosters it replaced So the American government abandoned use of the Shuttle for satellite launches and allowed production of expendable launch vehicles to resume. But the Shuttle was now the only American manned spacecraft, so a new mission was needed for it. It was claimed to be safe and that only its 'unique' design would allow NASA to assemble a space station. So the International Space Station was born - and it stretched out in time and cost, until it went for decades. By 2000 the shuttle was getting old, and America had no other manned re-entry vehicle that could take crews to the space station and back. NASA had decisively squelched development of any other manned spacecraft in the 1980's and 1990's as a threat to the very existence of the Shuttle. NASA decided that it would be prudent to start the long definition process for an Orbital Space Plane, a shuttle successor that would be launched by an expendable launch vehicle. Then in 2003 the space shuttle Columbia was lost during re-entry. The final shuttle myth - that it was safer than alternatives - was demolished. Flights of the shuttle could only be justified to complete assembly of the space station, it was decided. They would have to end by 2010. A successor would have to be ready for flight before then. Meanwhile President Bush decided to back yet another in-the-future-but-unfunded grandiose manned space exploration program. The Orbital Space Plane was renamed the Crew Exploration Vehicle (CEV). Now the requirements for the spacecraft would be not just to return from earth orbit, but from the moon and Mars. In the original 2003-2004 concept a CEV program would provide the hardware to replace the space shuttle in support of manned operations in low Earth orbit as early as 2010. Otherwise only the Russian Soyuz spacecraft would be available to support International Space Station operations between 2010 and the station's planned retirement in 2016. The CEV would then be used to support a manned landing on the moon by 2015, followed by a landing on Mars by 2030. The optimum CEV would have a mass of under 9 metric tons and a crew of four or less. The lowest cost launch solution would be to use existing expendable launch vehicles (Atlas V and Delta IV) or their derivatives. This would allow launch of the CEV on earth-orbit missions by a single existing EELV. Three-booster versions of existing EELV's could orbit elements of lunar or Mars expeditions. Summary ATK Thiokol made proposals in 2004 for a shuttle-derived booster to launch cargo payloads of 18 metric tons, or the manned CEV Crew Exploration Vehicle, into low earth orbit. A single shuttle solid rocket booster would be mated with an upper stage in the 100 metric ton class. By then NASA had used up half a decade in studies and the 2010 operational date for the CEV was not feasible. A half-decade gap in ISS support yawned between the retirement of the shuttle and the commencing of CEV flights. NASA obtained White House backing to reject all of the contractor's proposals, abandon the 'long, expensive, spiral development process', and plunge ahead using 'existing technology' and NASA's 'best judgment'. On June 13, 2005, NASA announced the down-select of two potential CEV contractors. However the selected contractors would only build a CEV to NASA's own design, using the launch vehicle NASA selected. And that launch vehicle would be a 'Shuttle-Derived-Vehicle, as suggested in 2004 by ATK Thiokol. NASA's own studies led it to a similar vehicle, but with a larger upper stage and a 25 metric ton payload. The components of this vehicle would be augmented and clustered to make a Saturn V-class vehicle for the Orion return-to-the-moon mission. Incredibly, NASA's crew requirement was increased to six, and CEV launch mass to 30 metric tons. This guaranteed that the CEV could only be launched atop a Shuttle-derived, NASA-operated launch vehicle. The CEV would be used initially to provide access to the International Space Station after the retirement of the Space Shuttle in 2010. Thereafter it would provide the earth return vehicle for missions to the moon (by 2020) or Mars (by 2030+?). The CEV's Crew Launch Vehicle was a shuttle-derived two-stage rocket consisting of a single Shuttle RSRM solid booster as the first stage and a new second stage, 5.5 m in diameter, using Lox/LH2 propellants and powered by a single SSME. For lunar missions a heavy-lift Cargo Launch Vehicle, using multiple Thiokol solid boosters, and a core stage derived from the Shuttle external tank and SSME engines, would be used. By January 2006 the CEV's first flight had slipped to 2011 or 2012. A month physics and the cost of the Shuttle SSME led NASA to change the Crew LV configuration. The design went from a four-segment SRB + SSME-powered second stage to a five segment SRB + J-2S-powered second stage. The J-2S was to be a modification of the engine developed for the Apollo program in the 1960's. Three months later the SSME was abandoned for the Cargo Launch Vehicle as well - now five RS-68 engines from the Delta IV booster would be used. Meanwhile the vehicles all received names - Ares I and Ares V for the Crew and Cargo Launch Vehicles, Orion for the CEV, and Altair for the LSAM. Within months both boosters morphed into an all-new designs. By late 2008 the J-2S, using a kluge of new, foreign, and domestic design elements, had become the long pole in the CEV development tent. Fundamental decisions regarding its design still had not been made. The five segment RSRM's, as predicted, created a severe vibration problem that would require unmanned flight tests to fully understand. Meanwhile Orion and Altair weight growth had forced the Ares V to change to a different, 5.5 segment RSRM booster with new propellants; six 'modified' RS-68B's in place of five RS-68's; with its size constrained only by the height of the Vertical Assembly Building at the Kennedy Space Center. First flight of the Ares I with a manned Orion had moved into 2016 (the original retirement date of the ISS), and the Ares V was still just an ongoing five-year-long detailed design study, for a manned lunar mission that looked increasingly unlikely. Stage 0. 2 x Shuttle ASRM. Gross Mass: 625,000 kg (1,377,000 lb). Empty Mass: 75,000 kg (165,000 lb). Thrust (vac): 15,566.115 kN (3,499,402 lbf). Isp: 286 sec. Burn time: 133 sec. Isp(sl): 259 sec. Diameter: 3.81 m (12.49 ft). Span: 3.81 m (12.49 ft). Length: 38.41 m (126.01 ft). Propellants: Solid. No Engines: 1. Engine: Hercules. Other designations: Advanced Solid Rocket Motor. Status: Development 1990. Stage 1. 1 x Ares Stage 1. Gross Mass: 787,700 kg (1,736,500 lb). Empty Mass: 64,200 kg (141,500 lb). Thrust (vac): 8,705.990 kN (1,957,184 lbf). Isp: 453 sec. Burn time: 480 sec. Isp(sl): 363 sec. Diameter: 8.70 m (28.50 ft). Span: 8.70 m (28.50 ft). Length: 43.00 m (141.00 ft). Propellants: Lox/LH2. No Engines: 3. Engine: SSME. Status: Study. Comments: Modification of shuttle external tank. Includes 28.6 metric ton SSME engine pod. Stage 2. 1 x Ares Stage 2. Gross Mass: 172,000 kg (379,000 lb). Empty Mass: 13,200 kg (29,100 lb). Thrust (vac): 1,113.000 kN (250,212 lbf). Isp: 465 sec. Burn time: 640 sec. Diameter: 10.00 m (32.00 ft). Span: 10.00 m (32.00 ft). Length: 16.00 m (52.00 ft). Propellants: Lox/LH2. No Engines: 1. Status: Study. Comments: Trans-Mars injection stage. Nominal single engine; alternatively 7 RL10-derived engines. Heavy Lift Carrier 2011 American heavy-lift orbital launch vehicle. ATK Thiokol concept for a shuttle-derived heavy lift vehicle. The shuttle orbiter would be replaced by a 6.5 m diameter x 35 m long cargo container, powered by three Space Shuttle main engines. 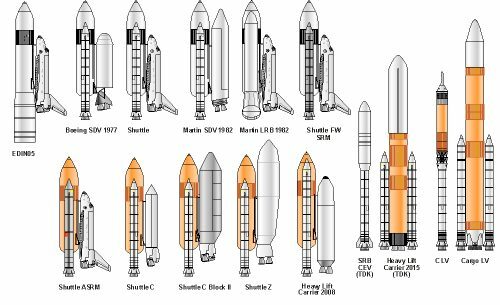 The shuttle RSRM motors would have a fifth segment added, and the External Tank would be stretched to 56 m long. Availability would be six years after go-ahead. Heavy Lift Carrier 2015 American heavy-lift orbital launch vehicle. ATK Thiokol concept for a shuttle-derived heavy lift vehicle with a lift equivalent to the Saturn V. The radical reconfiguration would put all elements in-line. Four SSME engines would be at the base of a stretched external tank, flanked by two shuttle RSRM motors with a fifth segment added. Atop this would be an 8.7 m diameter LOx/LH2 stage, followed by a 10-m diameter payload fairing. Availability would be ten years after go-ahead. Heavy Lift Carrier 2008 American heavy-lift orbital launch vehicle. ATK Thiokol concept corresponding to earlier Shuttle-C proposals. The shuttle orbiter is replaced by a 6.5 m diameter x 25 m long cargo container, powered by two Space Shuttle main engines. Availability would be three to four years after go-ahead. SRB CEV American heavy-lift orbital launch vehicle. Launch vehicle design preferred by NASA Administrator Mike Griffin to boost the manned CEV Crew Exploration Vehicle into low earth orbit. 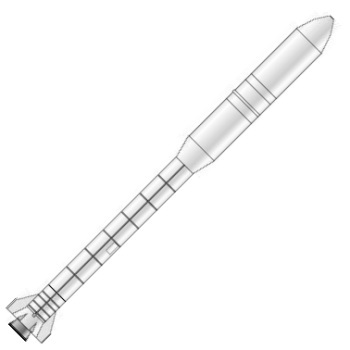 A single shuttle solid rocket booster would be mated with an upper stage in the 100 metric ton class. Ares V American heavy-lift orbital launch vehicle. NASA baseline heavy-lift vehicle to renew manned lunar exploration by 2020. Family: heavy-lift, orbital launch vehicle. Country: USA. Agency: NASA.